Hello, and I pitch in to wrap up our blog. Sustainable development is a multi-dimensional, complex topic that is, and should be, viewed through a variety of lenses, but it is often impossible to have all the lenses with us, even if we want to. During Rio+20, SciDev.Net looked at it through the science lens, offering a rich fare of issues from energy for all, to oceans, to agriculture to technology transfer and the role of science in sustainable development. That coverage was peppered with a view of the scenes outside the conference venue, including exhibitions and the bustling people’s summit (see earlier entries in this blog). 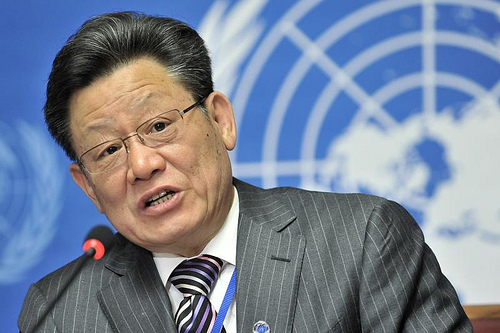 The conference secretary general, Sha Zukang, says the summit achieved some notables: including a “substantive pathbreaking outcome”; a registry of voluntary commitments from corporates, international agencies and others for sustainable development; and the ‘zero hunger challenge’ initiative. “We would have been happier if there had been more science in the document. But the outcome document is something we can build on,” Rajendra Pachauri, chair of the Inter Governmental Panel on Climate Change, remarked to me. Civil society was predictably furious over what Greenpeace’s Kumi Naidoo described as a “missed historical opportunity” to see a stronger agenda through. Many of us living in developing countries, including me, recognise the complexity of sustainable development — the sheer magnitude of poverty in some areas; the inequity within countries that has worsened as economies grow and the never-ending ‘environment versus development’ tension as we struggle to lift millions out of poverty and provide access to clean water, sanitation, energy, education and jobs. I would like to mention two lasting impressions as I sometimes switched the science lens for other lenses. I, like countless women, am left aghast that this summit has regressed on women’s reproductive health and rights issues which has implications for access to safe contraception and family planning services. It is Rio minus 20 on that count. Then I am left uneasy with this corporate juggernaut — it was there with all its public relations machinery. Jose Maria Figueres, president of the nongovernmental organisation Carbon War Room, told the media that, while governments let Rio+20 down, corporates took it forward. Time to watch out for who will be in the driving seat from now on. But then as Sha Zukang philosophically noted, such meetings leave “everyone equally unhappy … equally unhappy means equally happy,” he observed. So be it. 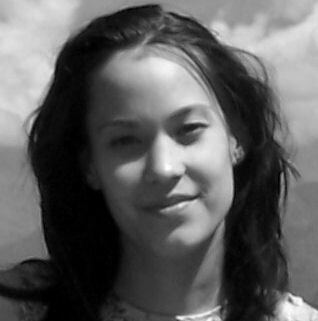 This blog post is part of our Forum on Science, Technology and Innovation for Sustainable Development blog which takes place 11-15 June 2012. To read news and analysis from the conference please visit our website. Every day of the conference, the number grew. When it reached the first hundred, it seemed quite good. Two hundred was unexpected; four hundred a surprise. On Friday afternoon, at a press conference, it was announced that the number was 692 and last night the automatic meter posted on the Rio+20 official site read 705. This is the number of voluntary commitments — formal promises to deliver concrete results for sustainable development — that the UN encouraged everyone, from governments to civil society, to make. Registration of a commitment required deliverables and a target date. The 692 are supposed to be worth US$ 513 billion. 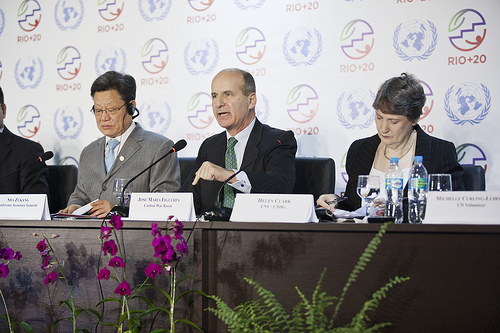 Brice Lalonde, executive coordinator of #rioplus20, said these commitments were a “major” success of the conference, and Nikhil Chandavarkar, UN chief communicator at Rio+20, said that they demonstrated that all the world community is engaged. The commitments are divided inot 23 areas ranging from biodiversity to communications on sustainable development to technology and innovation. For example, the government of Mauritius has committed to turning at least a quarter of its territory into a protected area by 2030, and the Pacific islands have agreed to empower 100 women entrepreneurs in green economy businesses by 2015. The United Nations International Strategy for Disaster Reduction (UNISDR) said it would create a Resilient Cities and Nations Collaborative Platform by 2016. Science did not stand out in the list. Only two commitments have been assigned to the Technology and Innovation category, although other commitments include some science. “I think the problem of science is that there are still two worlds [politics and science] that don’t speak enough to each other”, Lalonde told SciDev.Net. In fact, the Science and Technology Major Group is practically hoarse after its efforts to talk to politics leading up to Rio+20. Perhaps scientists ought to register the major new research enterprise, Future Earth, which has its sights firmly fixed on the problems of sustainable development, in the compendium of commitments. Chandavarkar urged the signatories to now fulfill their commitments. “What differentiates a commitment from a good intention?”, asked Jose Maria Figueres, president of the nongovernmental organisation Carbon War Room.”Accountability. And I look forward to all these promises being kept”, he added. 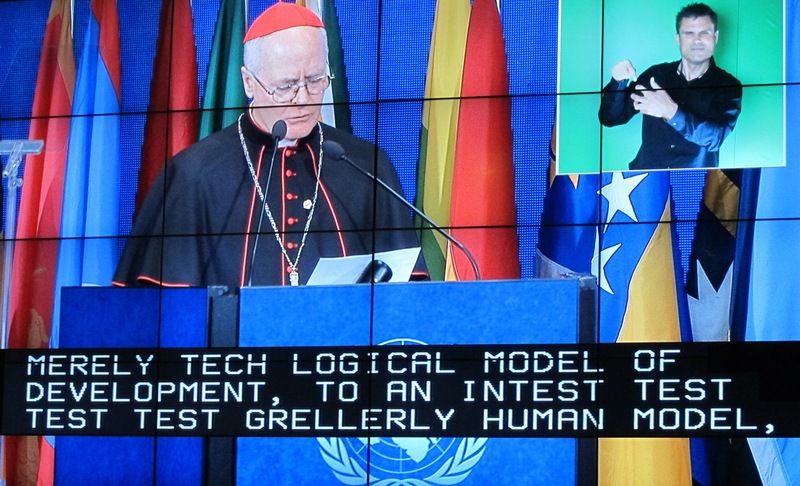 Live captioning at Rio+20 is a testament to the successes and shortcomings of speech recognition technology today. That conference organisers trusted the technology enough to let it loose on the plenary floor is impressive, but depending on it to document or report developments could get you into some trouble. Let the text speak for itself on the difficulties it faces, when at a side event for the Sustainable Energy for All initiative it proclaimed: “The challenge will be how to do even wonderful string”! “Let’s be oftenest”, in the textualised words of Hillary Clinton, there’s a difference between arable land and “airable land”. And the Prime Minister of Samoa may have scripted so, but it is questionable whether Rio is of any “spatial significance” to small island states. Reading Clinton’s lines would have one believe that she thinks ‘when’ but not ‘whether’ to have kids is a woman’s right: “Women must be empowered to make decisions about Mr. and when to have children”. More to the point, though, was the Somoan PM’s comment on how satisfying everyone’s goals was elusive, and an “exercise in fertility”. Sometimes subtext emerges in the text, like when Clinton described U.S. efforts “under the I don’t want initiative on urban sustainability”. 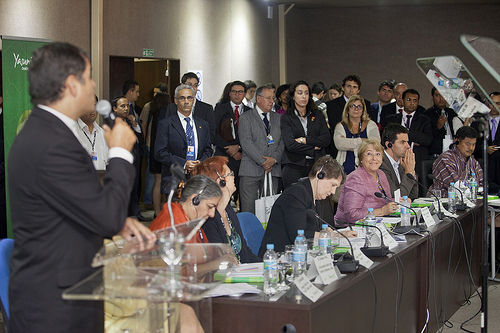 It was only ‘noted’ in the final outcome document of Rio+20, but the Secretary General’s Sustainable Energy for All (SE4All) initiative was applauded on the sidelines. At the final press conference and three-hour side event following it on 21 June, commitments to universal energy access, and to doubling both efficiency and the share of renewables by 2030 rained down on a packed room. Over the last nine months, and culminating at Rio, the initiative has collected commitments that, if honoured, will deliver energy access to more than a billion people, mostly in developing countries, and private investment worth over US$50 billion towards all the three targets. Some countries have made financial pledges, and others have agreed to regulatory reforms. For example, the US will leverage US$2 billion in grants, loans and loan guarantees for clean technology, and Norway guaranteed $140 million to projects in Ethiopia, Kenya and Liberia. 50 states from Africa, Asia, Latin America, and including small island developing states, have signed up to develop energy plans and programmes that would attract investment, some even setting themselves energy targets (Barbados is aiming for 29 percent renewable use by 2029). A quick skim of the list (see the Cloud of Commitments online http://www.cloudofcommitments.org/commitments/byplatform/sustainable-energy-for-all) reveals that these are mostly an assortment of private sector commitments. Large financial institutions and banks pledged to finance projects, like Bank of America ($35 billion for energy), and the European Bank for Reconstruction and Development ($8 billion for projects in Eastern Europe and Central Asia). Major companies assured steps towards reducing their own carbon emissions, including Microsoft (carbon neutral by 2013), Nike, Inc. (reducing CO2 emissions by 20 percent in five years), and Unilever (halve environmental impact of products). Some focused on education, like the U.A.E.’s Masdar High School Prize, and GDF Suez’s promotion of social entrepreneurs. And some simply vowed to continue ongoing work, like Statoil’s ‘no production flaring’ policy. The list also includes plans to set up a Clean Energy Finance University, share modelling tools and create jobs. But given their voluntary nature, the challenge following Rio+20 would be to “track those commitments,” said Kandeh Yumkellah, director-general of the UN Industrial and Development Organization and co-chair of the High-level Group. Besides an open-access tracker, the initiative also plans to establish a baseline (set at 2012) and indicators for all three energy targets, similar the Human Development Index. Some of the initiative’s success with the private sector can be attributed to the fact that renewable energy has become more competitive over the last 20 years. “The time is right for heavy investment in renewables,” said José Goldemberg, Brazilian expert on energy and environment. But “private sector commitment is the least you could ask for,” he added, referring to the failure of governments to commit to any quantitative energy targets in the final outcome document. Like a celebrity — arriving at what until then was just another low-profile Rio+20 side event— Ecuadorian President Rafael Correa entered the packed room and tens of photographers shot pictures and the public applauded. Seeing people with Panama hats, some with indigenous ornamental feathers and others chatting very excitedly in Spanish, made it easy to tell that the topic of this session had something to do with Latin America. The session ‘Yasuní initiative: changing paradigms for a sustainable future’ had one of the most high-level panels, and people responded. Michelle Bachelet, former Chilean president and UN Women executive director; Helen Clark, former New Zeland prime minister and current head of the UN Deveolpment Program (UNPD); and Vandana Shiva, environmental activist, scientist and Alternative Nobel Prize recipient, were some of the international leaders that accompanied Correa, who was wearing his traditional formal clothes: a suit and a white indigenous embroidered shirt. After Ivonne Baki, State secretary of Yasuní initiative, made an eloquent introduction, Correa began by reminding how, during the United Nations General Assembly in September 2007, he announced that Ecuador had decided to forego the exploitation of oil in the Yasuní-ITT area, located in Ecuador’s Amazon rainforest. This decision was “a substantial sacrifice for a small developing country whose economy still depends on petroleum, choosing to put social and environmental values first, while exploring other ways to benefit the country economically”. By leaving the estimated 846 million barrels of oil “indefinitely” underground, Correa said his people were contributing to combating global warming by avoiding the emission of approximately 407 million tons of CO2, that in present oil prices worth US$14 billion. The 982.000 ha Yasuní National Park is one of the five biodiversity hotspots on the planet, with around 100.000 species per hectare: 2.274 types of trees and bushes, 169 of mammals, 141 of amphibans and 121 reptiles. It is also home to two indigenous cultures —the Tagaeri and the Taromenane— living in voluntary isolation. But Ecuador can’t afford losing so much money, even in order to preserve nature. So in exchange, Ecuador decided to seek financial contribution of the international community as a gesture of co-responsibility in the fight for climate change. The Yasuní-ITT Trust Fund, administrated by the UNDP, was established in 2010 to raise US$3.6 billion in contributions, which will be used to finance renewable energy projects. “This is the most concrete initiative in this conference to save the planet. It means moving from rethoric to facts”, said Correa. Ute Coczy, member of the German Parliament and part of the German official delegation supporting the initiative, agreed with Correa: “[The Yasuní initiative] is still a very unique one, but it gives me more hope than all the other papers and proposals that are being discussed at Rio+20”. For her, now the question is: “Is the world really ready for this initiative?”. With an engaging speech, Shiva also applauded Ecuador, saying that “it is first country to have the courage and the imagination to protect the Earth and Human Rights”. And she concluded: “Good ideas are coming from small countries. Smallness is the promise of the future, smallness can multiply”. At the end of the session, the Yasuní initiative signed an agreement with the Regional Government of Wallonia, Belgium, that donated US$1.5 million to the Trust. And after this, Correa and the panelists left the room like celebrities followed by the flashes from the cameras. The last few days have been a far cry from the sunny Rio of the last week; our punctual driver’s impeccable scheduling; and relaxed conference sessions. The other day, our car broke down as we were stuck in heavy traffic and we had to walk a mile to the conference as VIPs were fast-tracked to the first day of Rio+20 summit. It felt like a war zone with heavily armed police-and army-personnel summoned to protect the heads of state. Yet the worst danger seemed to have been the Vegans for Peace protesters who gave out free breakfast and lunch outside the conference centre (which I somehow managed to miss). But all that was easy to endure because I had plans to see Arnold Schwarzzeneger in the evening. The appointment was for 8pm at the Copacabana Palace, where he was to launch an online database of 100 chosen and scalable innovations for sustainable development – the Sustainia100. So interesting was the prospect that I decided to pull out of a dinner I organised for fellow journalists. I returned to dinner where I was teased: Arnie had stood me up. Although perhaps I would have understood Sustainia a bit better if I’d went along to the launch. Sustainia says its solutions, coming from 56 countries represent sustainable innovation in areas such as city planning, energy, fashion, water and waste management, high-tech and transportation. “Sustainia is a new approach to a way how we communicate about sustainability,” says its executive director, Laura Storm. But for a communication tool, they don’t seem to communicate very well: it is pretty hard to pin down exactly what Sustainia is, what it does, or what exactly these 100 solutions are and how they can be scaled up. Maybe I am missing something – but feel free to have a browse around their website and leave comments below if you manage to figure out what this of solution actually is. You leave comments and I’ll be back. The ocean and the sea have always been a source of literary inspiration. Now, UNESCO is bringing people together to write about the ocean, in what they call “the longest poem ever written on a beach”. 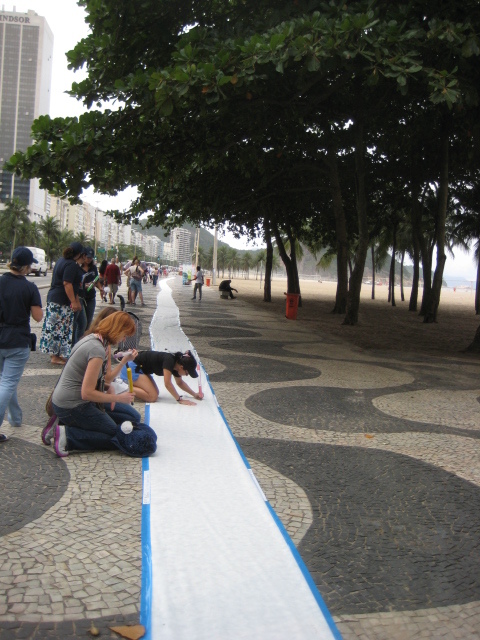 The poem is 150 meters long and anyone can contribute to it, in any language. With the initiative, UNESCO aims to call attention to the fact that 40 per cent of the world’s oceans are already heavily affected by human activities, including pollution, depleted fisheries and loss of coastal habits. “Careful management of this essential global resource is a key feature of a sustainable future”, says UNESCO’s promotional material. We started the project five years ago in Mexico and, since then, we’ve been to 45 cities in 19 countries; Rio de Janeiro is the first city in Brazil”, Angel Arenas, coordinator of the project and international representant of UNESCO in Andalucia, Spain, tells SciDev.Net. The poem is being held in Rio, and was available for participation on 21 June, at Copacabana beach. You are currently browsing the archives for the Rio+20: United Nations Conference on Sustainable Development category.